Osteoarthritis, or degenerative joint disease, is the most common type of arthritis. It is associated with the breakdown of a joint's cartilage. Cartilage is a firm, rubbery material that covers and cushions the ends of bones in normal joints. Its main function is to reduce friction in the joints and serve as a "shock absorber." Obesity. Maintaining an ideal weight or losing excess weight may help prevent osteoarthritis of the knees, hips, and back. Weight loss can also decrease the progression of OA. Heredity. Some people have an inherited defect in one of the genes responsible for making cartilage. This can cause defective cartilage, which leads to more rapid deterioration of joints. People born with joint abnormalities are more likely to develop osteoarthritis, and those born with an abnormality of the spine (such as scoliosis, a curvature of the spine) are more likely to develop osteoarthritis of the spine. X-rays may be used to confirm a diagnosis and to make sure that no other type of arthritis is present. Sometimes, blood tests are done. While blood tests cannot point to anything in particular that can help a doctor confirm the presence of OA, the tests can help the doctor rule out a different type of arthritis. Over-the-counter pain-relieving and/or anti-inflammatory medications: These include acetaminophen (Tylenol, for example), aspirin, ibuprofen (Advil and Motrin), or naproxen (Aleve). Topical treatments. Some medications in the form of creams, rubs, or sprays may be applied to the skin of affected areas to relieve pain and inflammation. Exercise: Physical activity can improve joint movement and strengthen the muscles that surround the joints. Gentle exercises, such as swimming or walking on flat surfaces, are recommended because they create less stress on joints. Activities that increase joint pain (jogging, high-impact aerobics, etc.) should be avoided. If you have arthritis, talk to your doctor to find out the best exercise routine for you. Prescription anti-inflammatory pain relievers: These help reduce pain and swelling in the joints. Hyaluronic Acid Injections: These medications can be given as injections to relieve pain in some people with osteoarthritis. Medications include Euflexxa, Hyalgan, Orthovisc, Supartz, Synvisc, and Synvisc-One. Cymbalta (duloxetine): Originally approved as an antidepressant, Cymbalta is also used to fight various forms of pain, including osteoarthritis pain. Joint protection devices: These can help prevent strain or stress on painful joints. Integrative therapy: Acupuncture has been shown to help relieve pain. While research is conflicting, there is some evidence that the supplements glucosamine and chondroitin may relieve some pain in some people with osteoarthritis, especially in the knee. Several studies have shown that SAMe may work better than prescription anti-inflammatory pain relievers in some people. Several other dietary supplements (including herbals) sometimes help OA pain. Check with your doctor before using these to see if they are right for you. Steroid injections. Your doctor can inject these potent medicines directly into your joint to help relieve pain. Using them too frequently can cause joint damage. 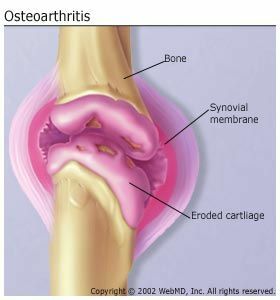 Centers for Disease Control and Prevention: Osteoarthritis. WebMD Health News: "FDA Approves Cymbalta for Chronic Musculoskeletal Pain."